This salad dressing is full of 3 of the 12 Top Anti-Inflammatory Foods. Inflammation has been linked to major diseases such as Alzheimer’s, arthritis, cancer, diabetes, heart disease, and signs of aging. Blend all above ingredients in a Blender. Taste and add more of any of the ingredients to your taste. Pour this salad dressing on the Powerful Anti-Inflammatory Salad with it’s 4 anti-inflammatory foods and you will be eating 8 anti-inflammatory foods in one meal. 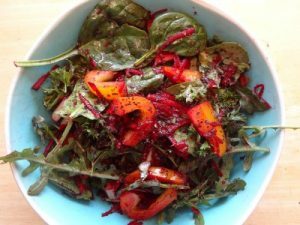 Powerful Anti-Inflammatory Salad – This anti-inflammatory salad is very nutritious with 4 of the 12 Top Anti-Inflammatory Foods. Make Your Own Olive Oil Lemon Juice Salad Dressing – This olive oil lemon juice salad dressing is always enjoyed by everyone who has it with one of my salads. 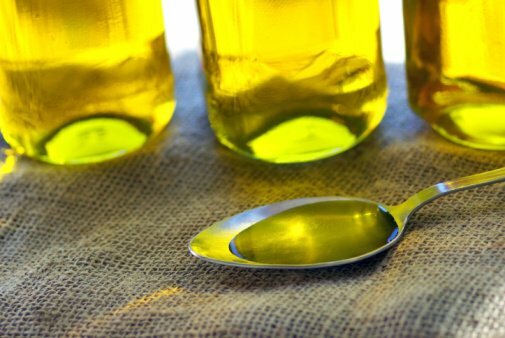 Have you heard of the olive oil fraud? Find out Which Olive Oil to Buy. Get healthy recipes and tips sent to your mailbox once a week with more information about these foods, subscribe to the newsletter. Why are we putting stevia in the dressing? It tastes awful. If you need the little bit of sweetness is it not better to use a little minimally processed sugar or raw unfiltered unheated honey? If I add balsamic vinegar to the recipe will it reduce the anti-inflammatory properties? Since olive oil solidifies in the fridge, but flax oil needs to be in the fridge; do I store the dressing in the fridge or at room temperature? Store it in the fridge for it to last longer. Yes, the oil will solidify so take the dressing out of the fridge a while before using it. Or you can put the bottle in a container of tap hot water.